“JAG” ran for 10 seasons, over two different networks, from 1995-2005 and left its military / legal DNA in the spin-off “NCIS” (CBS, 10 p.m.) which in turn spawned two other current spin-offs. 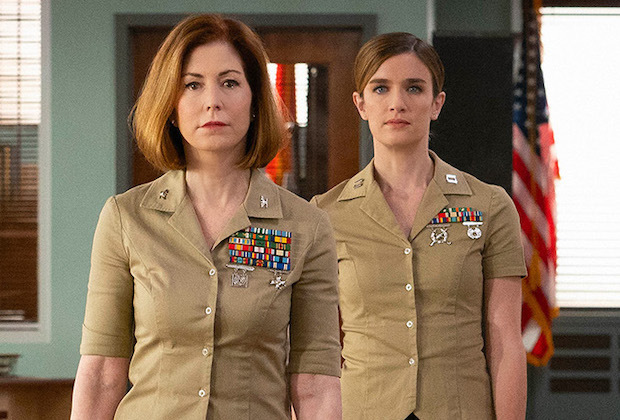 Now there’s more military law with “The Code” (CBS, 9 p.m.), concerning the Judge Advocate General attorneys with the U.S. Marines. It stars Luke Mitchell, Anna Wood, Ato Essandoh and Dana Delaney. In the premiere, a soldier in Afghanistan murders his commanding officer. It’s programmed tonight sandwiched between “NCIS” and “NCIS: New Orleans” (CBS, 10 p.m.) to catch their audiences, but “The Code” moves to its regular time slot Mondays at 9 next week. The appealing series “The Bold Type” (Freeform, 8 p.m.), about three young women fighting for a place in the magazine world, returns for its third season, with Katie Stevens, Aisha Dee and Meghann Fahy back from Paris and all reconsidering their relationships. In addition to his “Reconstruction: America After the Civil War” (PBS, 9 p.m., check local listings), Henry Louis Gates Jr. does a total public television takeover with “Finding Your Roots” (PBS, 8 p.m., check local listings ) investigating the past of Ty Burrell, Joe Madison and Valerie Jarrett. For the 15th season premiere of “Deadliest Catch” (Discovery, 9 p.m.), a massive new boat with a renegade captain finds the crab are all in on spot of the Bering Sea. Battle rounds conclude on “The Voice” (NBC, 8 p.m.). On the second season finale of “Splitting Up Together” (ABC, 9:30 p.m.), Henry isn’t considered a prime example for Milo’s Grandparents Day. What happens when there’s too many episodes of “Hoarders”? Start “Hoarders Overload” (A&E, 8 p.m.). There is a UFO Emporium re-opening party on “Roswell, New Mexico” (CW, 9 p.m.). Katie forgets Greg’s birthday on “American Housewife” (ABC, 8 p.m.). The latest “Town Hall” (CNN, 10 p.m.) of Democratic presidential candidates features Sen. Kirsten Gillibrand. The Katie on “The Village” (NBC, 9 p.m.) faces pregnancy decisions. The remaining 14 on “MasterChef Junior” (Fox, 8 p.m.) have to butcher a duck. The nosy one-hour documentary “Meghan & Harry: A Royal Baby Story” (TLC, 8 p.m.) exploits a British pregnancy, blending recent news footage with people whose business is to speculate about other people’s private business. A social episode of “The Profit” (CNBC, 9 p.m.) has Marcus Lemonis learning about his family’s past in Lebanon. On “The Kids are Alright” (ABC, 8:30 p.m.), Peggy storms out of the house following a grocery store mishap. Plans are made for Devante’s birthday on “Blackish” (ABC, 9 p.m.). Tray finds part time work in a school cafeteria on “The Last O.G.” (TBS, 10:30 p.m.). On “Boomerang” (BET, 10 p.m.), Ari’s birthday is celebrated (birthdays are a big plot point on series TV). Zach and Tori get a puppy on “Little People, Big World” (TLC, 9 p.m.). “Married at First Sight” (Lifetime, 9 p.m.) has a reunion. No motion sickness has yet been chronicled on “Mental Samurai” (Fox, 9 p.m.). On “The Real Housewives of Beverly Hills” (Bravo, 9 p.m.) Kyle and Lisa deal with their fight. The hospital struggles to operate without power during a storm on “New Amsterdam” (NBC, 10 p.m.). “The Rookie” (ABC, 10 p.m.) responds to a silent alarm at will.i.am’s house. Raquel considers dating again on “Mexican Dynasties” (Bravo, 10 p.m.). Of course “Miz & Mrs.” (USA, 10 p.m.) can’t get along with their neighbors. It’s Christmas for the “7 Little Johnstons” (TLC, 10 p.m.). The team has to stop digging on “Lost Gold of World War II” (History, 10 p.m.). The amateur sleuths march on in a four-night spotlight on Turner Classic Movies with “The Kennel Murder Case” (8 p.m.), “The Saint in New York” (9:30 p.m.), “The Gay Falcon” (11 p.m.), “Meet Boston Blackie” (12:15 a.m.), “Footsteps in the Dark” (1:30 a.m.), “The Detective” (3:15 a.m.) and “My Favorite Brunette” (5 a.m.). Earlier today, it’s all dramas and romance mostly from the 30s, with “I Loved a Woman” (6 a.m.), “I Found Stella Parish” (8 a.m.), “Secrets of an Actress” (9:30 a.m.), “Divorce” (11 a.m.), “Guilty Hands” (12:15 p.m.), “Mandalay” (1:30 p.m.), “The House on 56th Street” (2:45 p.m.), “Confession” (4 p.m.), “Jewel Robbery” (5:30 p.m.) and “One Way Passage” (6:45 p.m.). Baseball includes Toronto at Boston (ESPN, 2 p.m.), Yankees at Houston (ESPN, 8 p.m.) and Milwaukee at Angels (MLB, 11 p.m.). NBA action has Boston at Washington (TNT, 7 p.m.) and Houston at Oklahoma City (TNT, 9:30 p.m.). Before the hockey postseason starts, here’s the NHL draft lottery (NBC Sports, 8 p.m.). College baseball includes Creighton at Nebraska (Fox Sports 1, 7:30 p.m.). Men’s college lacrosse has Cornell at Syracuse (ESPNU, 6 p.m.) and Georgetown at Loyola (CBS Sports, 7 p.m.). Kelly Ripa and Ryan Seacrest: Kit Harington, Maria Menounos, Melissa Etheridge. The View: Chelsea Handler, Dr. Ian Smith. The Talk: Dionne Warwick, Matthew Gray Gubler, Chris Wragge. Ellen DeGeneres: Chris Hemsworth, Nikolaj Coster-Waldau, Hozier. Wendy Williams: Sasha Banks. Stephen Colbert: Michelle Williams, Emily Bazelon, Oscar the Grouch. Jimmy Kimmel: Nikolaj Coster-Waldau, Danai Guria, Backstreet Boys. Jimmy Fallon: Chelsea Handler, Justin Hartley, Brooks & Dunn with Midland, Bernard Purdie, Chuck Rainey. Seth Meyers: Timothy Olyphant, Diane Von Furstenberg. James Corden: Zoe Saldana, Jason Clarke, Kenny Deforest. Carson Daly: Jemele Hill, Nikki Lane, Jason Mitchell. Trevor Noah: Abby Wambach. Conan O’Brien: Patton Oswalt.